Dr. Ben Carson doesn’t really have a tax plan at all, yet he’s number 2 in the polls among conservative Republicans. On the other hand, Donald Trump has a very detailed tax reduction plan. In a nutshell, Trump’s plan eliminates taxes on individuals making less than $25,000 and on couples making less than $50,000, lowers the top marginal rate to 25%, just as Calvin Coolidge did under the 1924 Mellon Tax Bill, and lowers the top corporate tax rate to just 15%. It’s time for conservatives to grow up and start focusing on principles rather than personalities. Do that and Trump wins easily. The current tax code now exceeds 74,000 pages in length. That is an abomination. It is too long, too complex, too burdensome, and too riddled with tax shelters and loopholes that benefit only a few at the direct expense of the many. We need wholesale tax reform. And, we won’t get that from career politicians in Washington. They’re too deeply vested in the current system to deliver the kind of bold, fresh, new reforms that the American people are demanding. We need a fairer, simpler, and more equitable tax system. Our tax form should be able to be completed in less than 15 minutes. This will enable us to end the IRS as we know it. Yep, that’s it. Thus far, Dr. Carson has been able to skirt by without offering more than a shallow critique of the current tax system. His overly simplistic solution fails to address landlords, freelancers, investors, owners of pass-through entities, owners of multiple entities, corporations, trusts and estates, and the death tax to name a few. A simple tax form that takes 15 minutes might work for someone who receives one or two W-2 Forms, a pension, or Social Security benefits, but it’s not going to cut it for the varied real-life complexities that many Americans face in this day and age. “It is too long, too complex, too burdensome, and too riddled with tax shelters and loopholes that benefit only a few at the direct expense of the many.” Yeah, yeah, that’s what they all say, but what’s Carson’s alternative? In an interview with FOX Business Network’s Stuart Varney, Dr. Carson elaborated on his tax proposal, stating that it would be based on the Old Testament Biblical principle of tithing. Great, just like the Israelites were commanded to do around the year 1300 B.C. According to Dr. Carson’s statement above, “What made America a great nation was we had a very different attitude… That’s how we went from nowhere to the pinnacle of the world in record time,” as if to say that America once had a flat-rate tax structure. But when was that? Perhaps he’s confusing America with pre-Christian Israel, because prior to 1861, and between the years 1873 and 1912, the U.S. government was funded strictly through customs duties and tariffs levied on imported goods. And, although a 3% flat-rate tax was proposed under the Revenue Act of 1861, as a temporary means of funding the Civil War, no revenue was ever raised under the act, and it was quickly replaced by a progressive rate structure under the Revenue Act of 1862. At no time since the Revenue Act of 1913, and at no time prior, has the U.S. ever been funded by a flat-rate income tax. So where is Dr. Carson coming from? Okay, so if you make $10, $10,000 or $25,000 under Dr. Carson’s arrangement, you’ll pay $1, $1,000 or $2,500 in taxes. Never mind that depending on the size of your family, after your living expenses have been met, you might not have a penny left wherewith to pay it. Yet this he fathoms as fair. And, according to Dr. Carson, his program is great if you make $10 billion a year, but that’s primarily because you’ll see a 49% reduction in your effective tax rate, from where it is today. But for those less fortunate, including the entire middle class, Carson’s theory will result in a massive tax hike. Under Dr. Carson’s 10% Deal, individuals within the lowest, second, middle and fourth quintiles, that currently pay average effective individual tax rates of -7.5%, -1.3%, 2.4% and 5.8%, respectively, will see their tax rates rise by at least 72%, and by as much as 233%. Increasing the rate to 15% only compounds the problem. What’s wrong with this picture? Well, for one, the only growth it produces is among the uber-wealthy. In fact, it appears to be just another means of benefiting “only a few at the direct expense of the many” – a direct contradiction to his stated goal. So let me get this straight. Under Dr. Carson’s tax program, those in the highest quintile, including billionaires, who currently pay an average effective tax rate of 14.2%, will receive a 30% to 49% tax cut, while those in the lower quintiles receive a 72% to 233% tax hike. And how is this supposed to help the economy? More importantly, how does it help you and me? Well, it doesn’t. What Dr. Carson’s strategy actually does is make the rich richer and the poor soul down to his last $10 a dollar poorer. Carson mentions nothing about corporate tax reform, disincentivizing corporate inversions, balancing trade, growing the economy, or expanding the workforce. He claims his proposal will be revenue neutral, which is at best a farce, but even if it somehow were – why would anyone care? Dr. Carson’s approach ransacks the middle class, plunders the working poor, and only profits the wealthiest among us. 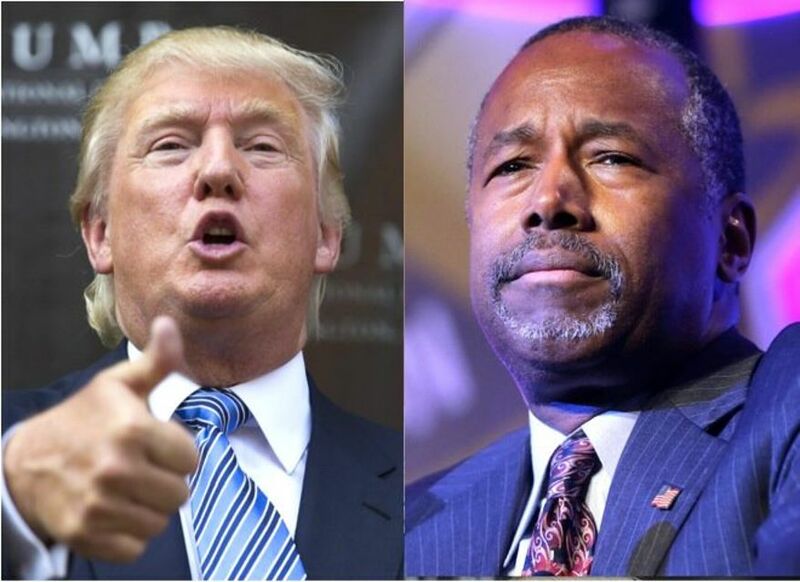 It’s a strategy unworthy of consideration by serious-minded conservative voters, as in my opinion is the entire Carson candidacy. Phooey! Tax relief for middle class Americans: In order to achieve the American dream, let people keep more money in their pockets and increase after-tax wages. Simplify the tax code to reduce the headaches Americans face in preparing their taxes and let everyone keep more of their money. Grow the American economy by discouraging corporate inversions, adding a huge number of new jobs, and making America globally competitive again. Doesn’t add to our debt and deficit, which are already too large. If you are single and earn less than $25,000, or married and jointly earn less than $50,000, you will not owe any income tax. That removes nearly 75 million households – over 50% – from the income tax rolls. They get a new one page form to send the IRS saying, “I win,” those who would otherwise owe income taxes will save an average of nearly $1,000 each. All other Americans will get a simpler tax code with four brackets – 0%, 10%, 20% and 25% – instead of the current seven. This new tax code eliminates the marriage penalty and the Alternative Minimum Tax (AMT) while providing the lowest tax rate since before World War II. No business of any size, from a Fortune 500 to a mom and pop shop to a freelancer living job to job, will pay more than 15% of their business income in taxes. This lower rate makes corporate inversions unnecessary by making America’s tax rate one of the best in the world. No family will have to pay the death tax. You earned and saved that money for your family, not the government. You paid taxes on it when you earned it. Again, this is only an excerpt; you may read the rest of Trump’s detailed tax plan on his website: Trump – Make America Great Again! Under the Trump Plan, those in the lowest quintile, and most in the second and third quintiles (depending on marital status) won’t pay any income taxes at all. This is brilliant, considering that as a whole it’s estimated that those making less than $50,000 currently receive back roughly $37 billion more from the government, each year, than they pay in (see table below). This is due to a series of redundant, and costly tax expenditures. Removing upwards of 75 million households from filing requirements actually amounts to savings of no less than $370 billion, in government speak. When it comes to simplifying the tax code, eliminating the filing requirements of some 75 million households turns out to be a big money saver. It will directly reduce the processing and subsequent examination, by the Internal Revenue Service, of around half of all tax returns currently filed. 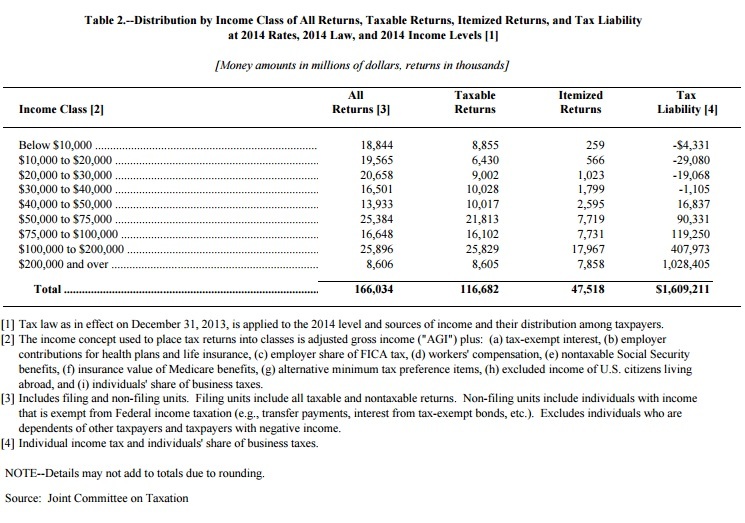 Since most individuals under this threshold only file to receive refundable tax credits, or to determine that they don’t owe any taxes at all, and around 37% of all individual returns audited involve the Earned Income Credit, once Trump’s plan is implemented the size of the IRS may be reduced dramatically. Under Trump’s plan, if you are single, the first $25,000 you earn won’t be taxable, and if you are married, the first $50,000 you earn will be exempt from taxes (see table below). This will amount to a huge tax cut for the many, at the expense of a few. Compared to Dr. Carson’s idea, where the government would get up to $2,500 or $5,000 from the same, Trump’s plan is a huge windfall for the working poor and middle class. Are you for lower taxes? Will this help you? Trump’s plan lowers the top marginal tax rate to 25%, or to the same level imposed from 1925 to 1931 under the 1924 Mellon Tax Bill. So this is not a shot in the dark, but rather a return to policies the U.S. had in place during the Roaring Twenties, back when the country truly was great. Compared to the present tax code, Trump’s plan will reduce income taxes for a married couple making $85,000 per year from around $8,800 to just $1,500 (assuming taxable income of $65,000). Does this appeal to you? Is there some part of this plan that you don’t comprehend? Trump’s tax plan also reduces corporate taxes from a top rate of 39% to just 15%, making the U.S. one of the most attractive places to do business worldwide. But then he goes a step further, by applying the same 15% cap to income earned by freelancers, sole proprietors, unincorporated small businesses and pass-through entities (i.e. partnerships and s-corporations), which are all taxed at the individual level. According to Trump, these lower rates will provide a tremendous stimulus for the economy, as in significant GDP growth, a huge number of new jobs and an increase in after-tax wages for workers. Finally, Mr. Trump’s plan eliminates the death tax, reduces or eliminates deductions and loopholes available to the uber-wealthy, phases out the tax exemption on life insurance interest for high-earners, ends the current treatment of carried interest for speculative partnerships, adds a one-time repatriation of corporate cash held overseas at a discounted 10% tax rate, ends the deferral of taxes on corporate income earned abroad, and reduces or eliminates corporate loopholes that cater to special interests. Coupled with his well aired balanced trade initiative, which seeks to eliminate our ongoing trade deficits with China, Mexico, Japan and other nations, every true Conservative is forced to concede that Donald Trump has a viable solidly conservative plan for this economy, and is indeed a serious candidate. Like him or not, when you lay Donald Trump’s tax reduction plan next to Ben Carson’s tax the poor philosophy, it’s clear that only one has a workable plan. Dr. Ben Carson may be a nice man, but it’s time to admit that there isn’t any substance behind his shallow rhetoric. It’s time for Conservatives to stop focusing on personalities, and start taking Donald Trump and his policies seriously. Comments are at Free Republic.